Empedocles was one of the ‘Pre-Socratic’ (Pre-Hellenic) philosophers of the ancient Greek world – a group of individuals including Pythagoras of Samos (attributed to the 6thC BCE, but possibly even legendary) about whom we know little except of what was reported much later. In the case of Empedocles, we are lucky as some of his contemporary writings survive. Empedocles is credited with developing the cosmogenic theory of the Four Elements (Earth, Air, Fire and Water) which her referred to as ‘roots’ of matter, and which was to dominate the worldview of the ancient European, North African and Middle-Eastern peoples right through to the 17th century. Whether or not he was the true originator remains to be seen, but he became an icon of this to the Greeks. His surviving fragmentary works were – like those of Homer and Hesiod – written in a poetic verse, suggesting a possible connection to an oral transmission tradition. He was as much concerned with spiritualism and religion as what we moderns would think of as ‘philosophy’ – to the ancients there was no difference. As a Sicilian Greek, he would have had access to and interest in the ‘Celtic’ peoples and their philosopher-priests. His belief in transmigration of the soul was supposedly shared by/derived from Pythagoras and was common to the Orphic/Eleusinian mysteries, as well as by the Atlantic Europeans. The Greeks would never admit that they derived anything or shared a common heritage with the ‘Barbarian’ world, of course! You will note that Plato talks of the ‘creator’ or ‘God’ as a single force (you’d need to check the Greek original, though!) – surprisingly like the idea of God to the Judaeo-Christian-Islamist faith it would seem. This might seem strange, until one realises that to Plato and the philosophers of this age this was a natural part of polytheism – the plural ‘gods’ were a description of the important functions and continuum of time and space between the philosophical absolute ‘Monad’ and the dissolution of chaos. This was quantum physics for the mind! To worship the Monad was as senseless as worshipping pure chaos. Although seeming mysogynistic to modern readers, Plato’s opinions about unworthy souls being reincarnated first in the body of a woman, and next in that of a ?beast have to be judged, firstly by the standards of his culture and age, and secondarily by considering the otherworld inversion principle I have made previous references to in terms of ancient spirit beliefs. For instance, the ancient Gaelic belief in hereditary healing and protective charms always had contrasexual inheritance as its core mode of transmission. Plato’s audience at his seminars were privileged Athenian males. In spite of his apparent misogyny, he was steadfastly devoted to the principles of Sensation (resulting, he believed, from the conflict between matter and spirit and the soul) and Love as the highest faculties motivating humanity. These, to him and his devotees of future generations, were represented in the Goddesses Athena (Strife) and Aphrodite (Love). The views of Pythagoras, Empedocles and Plato were to have a profound influence upon religious philosophy in the Hellenic and Roman empires, inspiring new generations of philosophers who flourished from the 3rdC BCE to the 4thC CE. The philosophical origins of christianity may in fact be based upon them – albeit with a one-sided doctrine of ‘Love thy Neighbour’ and the denial of the sensationalist aspect…. Lucan’s famous account attempts, in a few lines, to sum up the whole religious worldview of the defeated Gauls – one which he portrays as once savage and dangerous. He names four gods – Teutates, Hesus and Taranis, and very interestingly ‘Diana, goddess of the north’. It is perhaps surprising that he fails to mention by name the two particular gods who seem from epigraphic, numismatic, literary and historical evidence to have been very prominent in religious landscape of the Celts: Bel(enos) and Lug. It is fairly self-evident from Pharsalia, that Lucan has used Caesar as his source, albeit updated with the names of the indigenous gods. Lucan’s version, however, commences not with a mention of Mercury but with the allusions to the overly-proud barbarians and their fiery flowing locks of hair. Pride, as they say, comes before a fall – and perhaps the greatest and well-known example of this for the people of the ancient Roman world was the story of Alexander of Macedonia – whose ambition so famously over-reached his ability to outlive his conquests. The Celts were well aware of Alexander – they used his image on almost all of their coins. 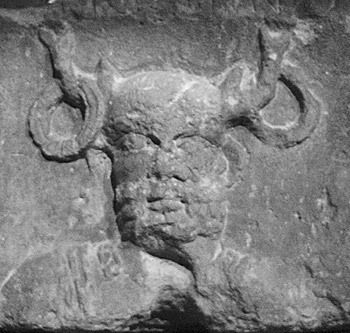 Horned figure from the ‘Pillar of the Boatmen’, named ‘Cernunnos’. ‘Cernunnos’ is a name obviously derived from the Celtic name for ‘Soldier’ (Cern), and he appears to be wearing a helmet with stags antlers on it: The image of the stag with adorned antlers is specifically associated with the ‘rut’ during which combats occur over mating rights, typically at territorial boundaries such as on plains near river crossings (such as with the battles in the Irish epic tale Tain bo Culainge). In a warrior-pastoralist culture the link between battles and fecundity is explicit in this image. In the same way, the branch is a symbol of fecundity for more arable-agrarian societies, and was widely used in Greek and Roman iconography. In fact, the antlers combine both images on account of their shape. Wings for that matter are also branched, as are bolts of lightning and rivers. The Pillar des Nautes is awash with Roman-Celtic syncretism. So – the god of wealth and fertility whom Caesar likened to Mercury and had ‘many images’ made of him was represented using the traditional image of Alexander with a cornucopia attached to his head. Lucan’s triple-set of names: Teutates, Hesus and Taranis (and their ‘blood-stained’ altars) may well all be a ‘triple aspect’ of the one he leaves un-named, teasing us with his palpable circumlocution of the underlying divinity he must have realised was represented. Lucan was a clever lad, and the gods (no doubt Mercury himself) were to receive him into Elysium at a young age – a ‘rock and roll’ life and death. But what about ‘Belenos’? Or, for that matter, ‘Lugus’? What even of the ancestor-god Caesar remarked upon as being called (or like) Dis Pater…. Might they all be one and the same? 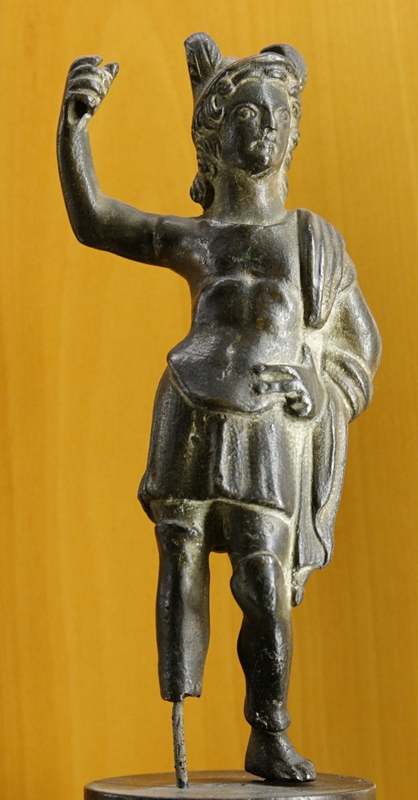 In terms of likeness to Mercury, it is Lug(us) who has usually been given this honour, and for whom there have been parallels found in the mythology of the ‘surviving’ Celtic language cultures of Wales (Lleu) and Ireland (Lugh), both of which associate with crafts. Lug (like Belenos) appears in placenames and inscriptions from all across the Atlantic European world, and into the reaches of the Danube river basin. 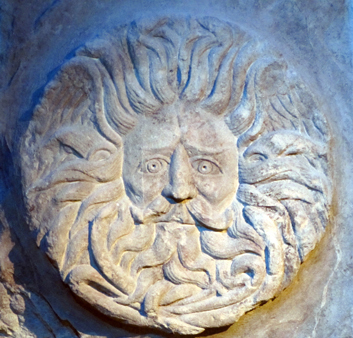 With the Romanisation of the barbarian Celtic cultures, the worship of Bel/Belenos would become submerged in the cult of Apollo, demonstrating that Bel/Belenos was an overtly solar deity. Some depictions even show Mars with wings – perhaps a convenient spiritual representation of what the Celts desired: Death in glorious battle and an ‘autopsychopompic’ flight to the Otherworld. 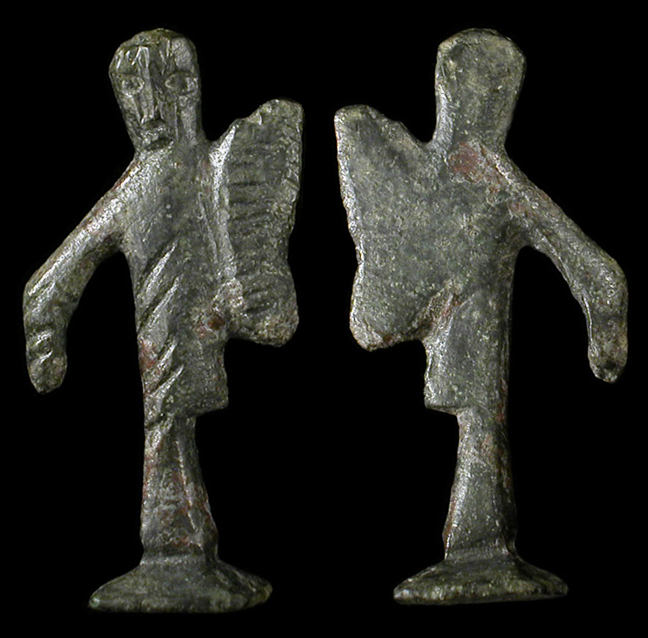 A ‘winged Mars’ – A winged figure is also seen on some Celtic 1stC BCE/CE coins. The horse depicted is also sometimes winged. 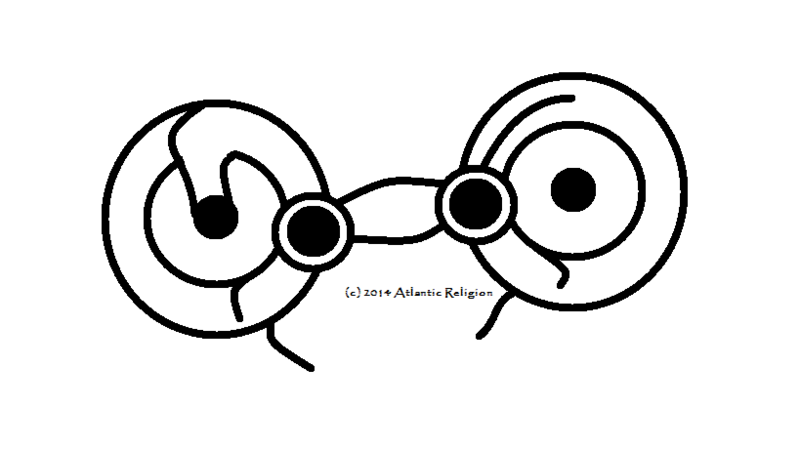 That the Atlantic Europeans before the Romans had a principally duotheistic religion comprising of a god and a goddess who each had a ‘triple’ identity. The imposition of Roman culture and then the overlay of Christianity created a ‘Celtic Pantheon’ which in truth never really existed. ‘Lugh’, ‘Belenos’, ‘Teutates’, ‘Esus’, ‘Taranis’ were all epithets of the same solar deity who conducted the souls of the dead in their Otherworld destinations. His companion ‘Diana’ (De Áine) had similar multiple-epithets and was associated with the worldy creation and manifestation. 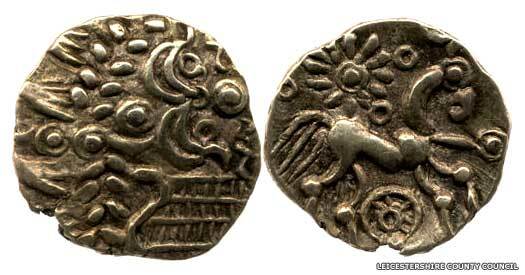 The mysterious symbolism of the horse pervades the artwork of the coins of the Iron Age Celtic peoples of Atlantic Europe. 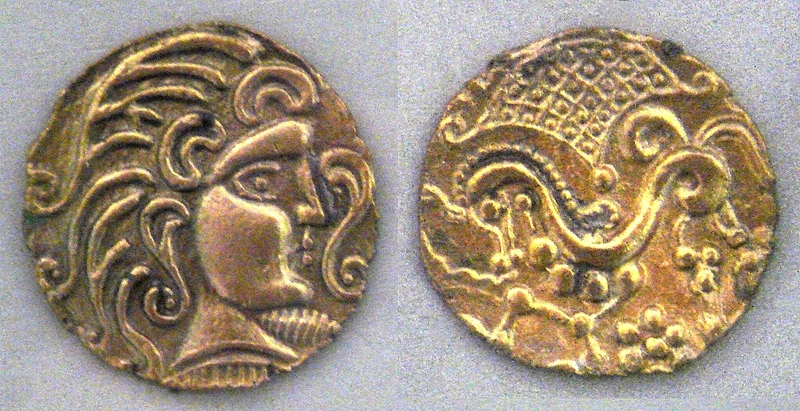 From the Thracian Celts of the Balkan region, to the tribes of Britain, Gaul and Hispania – all produced coins which depicted a strange and compelling set of images, perhaps providing a clue to the supra-regional religion of the peoples classified by the Greeks and Romans as the ‘barbarians’. 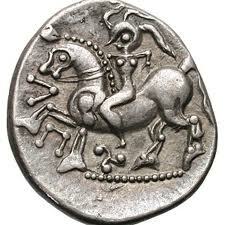 Celtic (Scordisci) coin from the Balkans depicting a woman riding a horse (?2ndC BCE). Note the apparent astronomical designs! 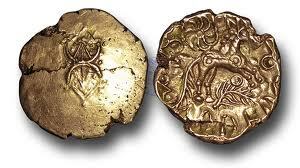 The history of coinage among the Celtic peoples lies in their economic links to the ancient Greek world – in particular through southern Gaul, Macedonia and Thracia at the height of Hellenic influence, and the Empire of Alexander the Great and his successors. 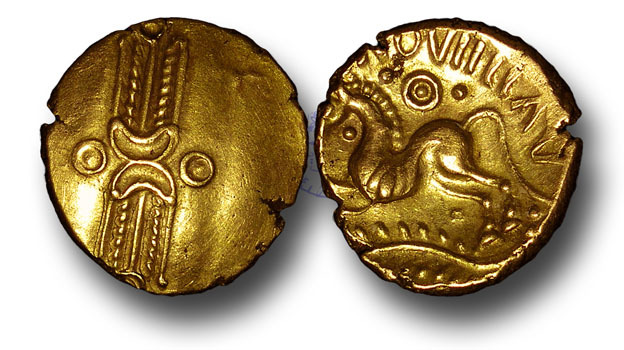 For this reason, the design of celtic coins was afterwards strongly influenced by the format of the Macedonian/Greek ones, some of which depicted the horned head of ‘Alexander’, sometimes Apollo, Hercules or Zeus on one side…. Coin of the Parisii ca. 1stC BCE. Note the depiction of the martial charioteer – apparently female, in the role of a ‘Badbh Catha’, seemingly trampling an ‘angel’ into the dust…. Trinovantes, Britain, 1stC BCE – what happened to Alexander’s head? Tetradrachm of Phillip II of Macedon – note the ‘Dioskouros’ on the obverse face… one of the famous Hellenic horseman-deities who would have been so popular in the ancient Balkans and steppes north of the Black Sea. 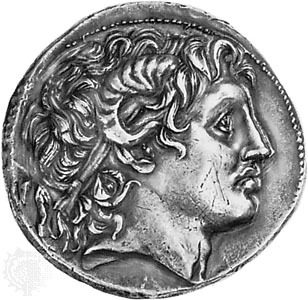 Ostensibly starting with a picture of Alexander’s father Phillip II the coins of the era of Alexander gloried in the imagery of the head of the conquering hero, and evolved between depictions of humans (Philip, Alexander) and gods (Apollo, Zeus, Herakles) depending on how successful and grandiose the ruler who minted them felt himself. In the fragmented succession period that followed Alexander’s death, depicting a god was often a safer bet than advertising your discombobulated head…. 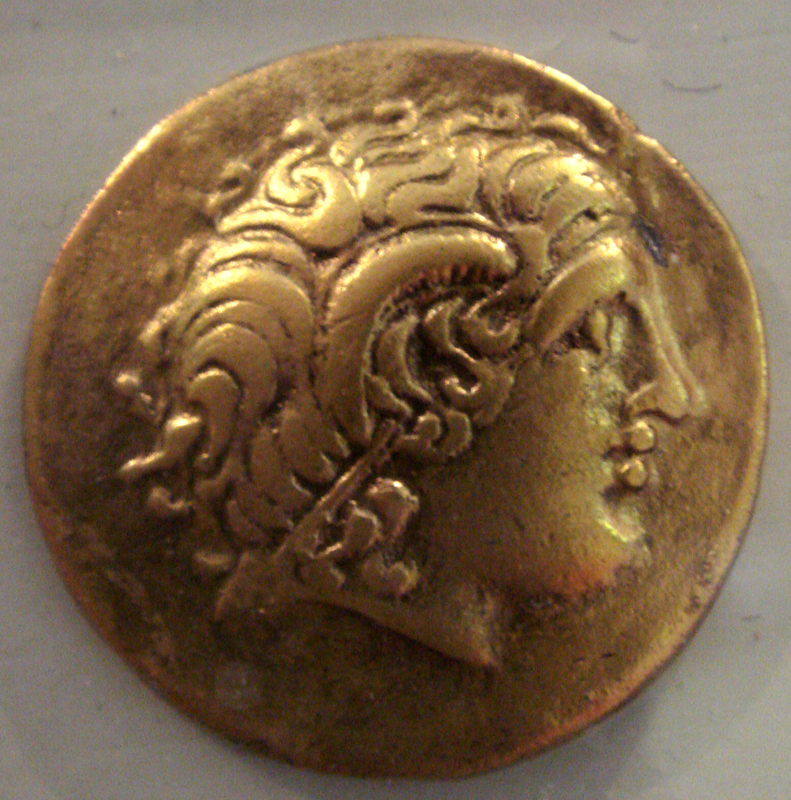 The totemic value of the Mercurial ‘Alexander’ among the peoples of Europe’s highly mobile barbarian warrior culture (in the La Tene period) cannot be underestimated, and it is perhaps unsurprising that they would copy the coins of the world’s most astounding military leader, whose legend had elevated him to a godlike status. Vast numbers of Celtic warriors had poured across and down through the Balkans in the 3rd century, culminating with an assault on Delphi itself, and many would afterwards find employment within the Seleucid Empire on account of their warrior prowess, just as ‘Viking’ warriors would in the Byzantine Roman Empire during the 8th-11th centuries. 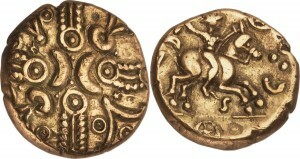 Belgic tribes like the Parisii (northern France) and their cousins among the Icenii, Trinovantes and Catuvellauni (eastern Britain) produced a great deal of the most interesting and beautiful coins which elaborated on and converted the Greek template designs to meet their own system of material and religious values. In the 3rd-1stC BCE their increasing power was no doubt bought about by trade (and pillage) with the Greek and increasingly powerful Roman worlds, which demanded or received coinage. We can tell that these tribes were powerful and influential due to the fact that they modified the design of their coins away from the Greek, demonstrating to the world their own culture and beliefs. They obviously understood the symbolism of the greek coins, but were to express their own through some significant changes and additions. 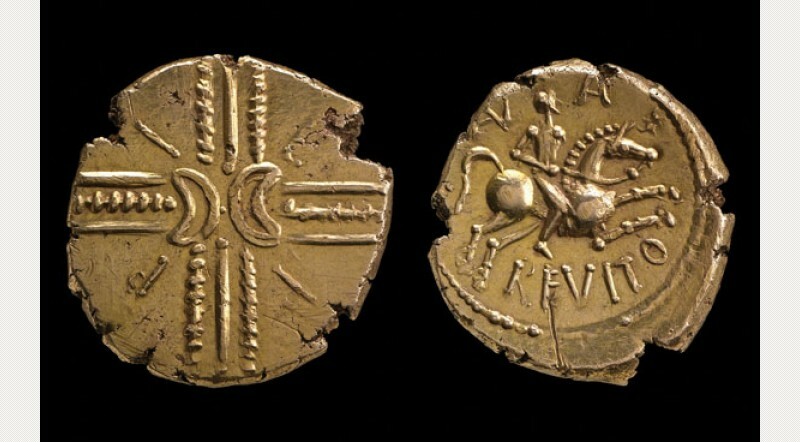 The coins of the Parisii (who occupied the region along the Seine) were typified by placing a star symbol under the front hooves of the horse, which was constructed of a circular arrangement of 6 (sometimes 5) dots. The other interesting feature of their coins was the ‘net’ design in the shape of a ‘tented inverted triangle’ above the serpentine horse, which usually faces left and is riderless. The Parisii further modified the coin template by feminising the head on the obverse side. Tree branch designs often decorate either side. There are no ‘sun wheels’ as seen in many British coins. Alexander has become a woman on this Parisii coin! Across the water in Britain, their cousins the Trinovantes must have watched in dismay, as well as interest as the Parisii and the rest of Gaul succumbed to Julius Caesar and his Roman legions in 52BC. They were another great and wealthy tribe, who – along with their neighbours the Icenii and Catuvellauni – stood to become increasingly wealthy from contact (and alliance) with Rome. 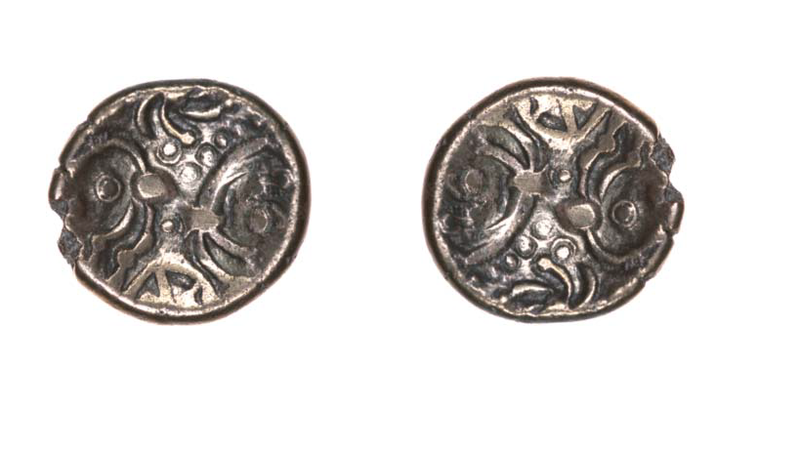 Their coins from this period demonstrate a more definite split from the Greek designs of the western European celts – perhaps showing more in common with their central European cousins who also excelled in stylising, perhaps when they too felt the pressure of Roman encroachment. To any well-connected and spiritually educated person of the Mediterranean world in the 1stC BCE – 1stC CE, the symbolism of the ear of corn was likely understood as a reference to the Rites of Eleusis held near Athens, and the veneration of Demeter – known to the Romans as ‘Ceres’. That it appears on the coins of Cunobelinus might be a reference to this cult – it is not implausible that he himself was an initiate in what was something akin to the Freemasonic Lodge of Europe’s elite! The rites were a mystery cult dramatizing the story of the annual cycle and the return of Kore (Persephone) from Hades. Caesar’s assertion that Celts such as Cunobelinus believed in reincarnation as instructed by the druids means that they would have had a spiritual sympathy with these rites, whose origins link to the Orphic beliefs originating somewhere in the lower Danube in the late Bronze Age, and hence possibly deriving from the indigenous belief system of the north Europeans. The tie-in between heads of corn and reincarnation is therefore obvious – especially at a time when Druidism and Celtic/Atlantic religion was under great threat. 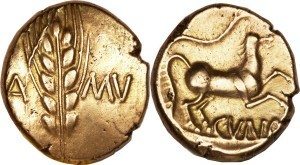 Coin of Adeddomaros – the allusion to heads of corn is gone, and the opposed crescent symbol is more obvious, as is the branch under the horse’s feet. One cannot help but be overcome with a feeling that the reflective symmetry and structure of the design on the obverse side to the horse is telling us something – much like the pictograms on the early medieval stone stelae of the Scottish celts or ‘Picts’. The same design occurs in other coins of the same period (immediately pre-conquest when druidism had decamped to Britain, and before the Britons began to Romanise). 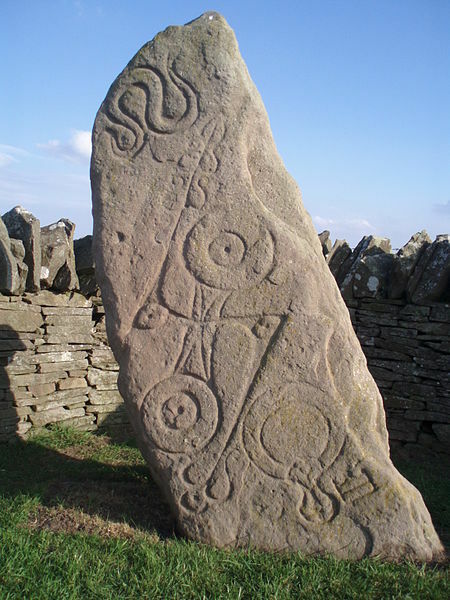 The cross-like symbol with its opposed crescents and solar discs seems to prefigure the ‘celtic cross’ by at least 500 years, and is rich in the symbolism of the annual cycle. The four ‘quarter days’ seem to be represented by the branches (or corn heads) forming the limbs of the cross, and joined to the solar symbols still used in astrology today: a circle with the spot in the middle. Between these are the solstices and equinoxes represented by torcs, rings or lunulae and ‘tented triangles’. In the centre of the cross lie the mysterious apposed lunar crescents – symbol of the months. The woman riding (side-saddle) on the horse is an innovation that we also see in the Balkan/Danube region (see the first picture above) but here it possibly also gains a martial significance – a people, a goddess and a whole religious way of life readying for war… A small serpentine figure occurs where the ‘star’ often appears – another feature seen in celtic coins from central Europe. Was this symbology copied in an effort to invoke the military success of the central European celts against Macedonia, Greece and then Rome? 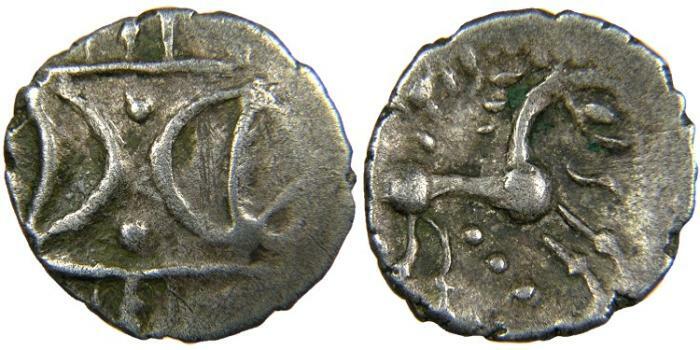 Another Belgic tribe who settled in Britain were the Atrebates and their coinage seems to demonstrate similar iconography to that of the Trinovantes and their neighbours. Note the horse with overhead sun apparently trampling a loose wheel. The pattern on the left is mysterious indeed! 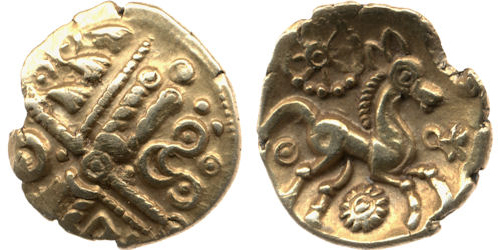 The composition of the imagery may vary in detail, but the obverse side to the horse shows consistent features, seen also in the coins of other tribes, such as the Iceni, Trinovantes, Durotriges etc: separate torcs, linked torcs (the ‘yoke’), crescent-moons, spots, serpentines, ‘corn ears’, branches or wreaths, linear lines, rings and what looks like leaf-shoots. All of these sometimes appearing like a Miróesque deconstruction of the image of Alexander. 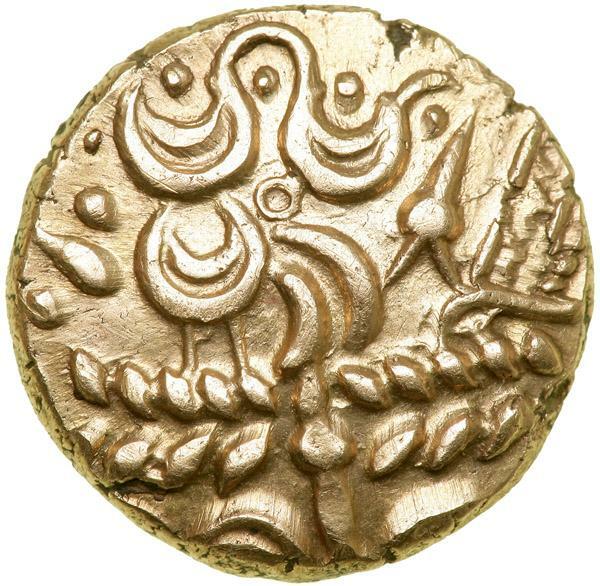 More detail on an Atrebates coin – is that a cockerel on the left? The symbolism is perhaps richer and more mysterious than any Greek or Roman coins… These coins provided inspiration for 20thC artists such as Miro and Picasso!